The MicroSaver Keyed Projector Lock from Kensington is a security lock designed for use with digital projectors. 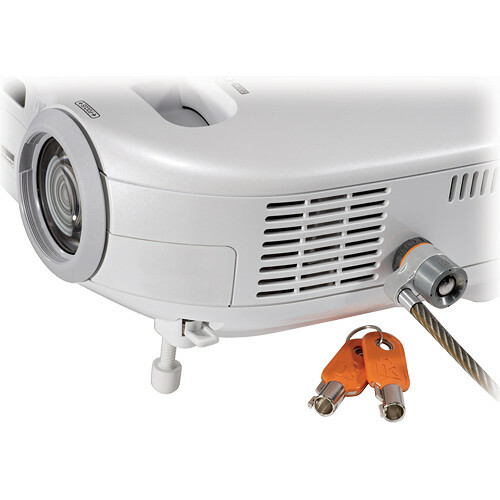 The lock uses Kensington's patented T-bar locking mechanism with a carbon tempered steel cable to protect your projector from theft. Two keys are included. Box Dimensions (LxWxH) 7.6 x 6.0 x 1.3"
MicroSaver Keyed Projector Lock is rated 4.0 out of 5 by 2. Rated 5 out of 5 by Eddie K. from Easy setup quickly secures flat panel We used this lock to secure a 21.5 flat panel monitor to a Balt AV Traveler Compact Mobile Media Cart, for classroom use at a major state university. (The monitor is physically secured to the cart with a H. Wilson WIERS 12' Ratcheting Monitor Safety Strap). Although the lock is advertised as a projector lock, it works with any device that is equipped with the standard Kensington Security Slot. The lock is well-designed and setup time is fast. Rated 3 out of 5 by Kerry the tech guy from Kensington Locks This product is a little bulky for the use of portable projector but great for stationary computers.